What is an acronym? What is an abbreviation? (or first letters of a phrase). It is a shortened word. Technically acronyms are also a kind of abbreviation. That's why I put them on the same page. Note: all content on this website is provided by Leon of Leonsplanet.com free of charge. It is original content. Yes, I may have done some research to find out what some of the acronyms are/mean, and to find some of the abbreviations (Google being my main source), but I (Leon) compiled all the information here on this page for easy reference to all of Leon's Planet users. This content may be copied and used for educational purposes, but be sure to give me (Leon) credit for compiling the information; and link to this page if possible. Did I miss some? Please contact me, if so. These are NOT acronyms, because they are NOT pronounced as words. One abbreviation I use a lot is "Ex." It means "Example". cc Carbon Copy In the old days, when I was a kid working for my father, we actually used carbon paper to make carbon copies. Note: We don't write 33lbs, because it looks like 331bs. So, to avoid confusion and mistakes, we use 33#, especially in the shipping industry. VAT Value Added Tax In some countries, you'll see this at hotels and expensive restaurants. (The idea is to gouge tourists). VIP (or V.I.P.) Very Important Person A "VIP Room" would be a room reserved for Very Important People. CPD C? Professional Development I'm not sure what the "C" actually stands for, but this is the British form of PD (See PD). CTT Cooperative Teacher Team Teachers of the same grade level or same subject. ESL English a Second Language A program that helps students where English is not their first language. MAP Measures of Academic Progress A kind of standardized testing. PD Professional Development Teachers have to have on-going training, called "professional development". PLC Professional Learning Community A group of teachers that work together for the benefit of their school. Bigger than CTT (see CTT), but smaller than whole faculty of the school. APA American Phonetic Alphabet Learn more here. [C] Countable Seen in EFL / ESL dictionaries / lexicons. 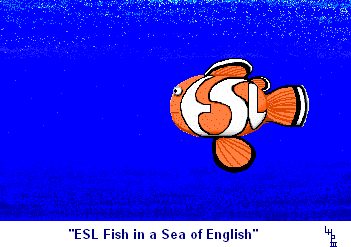 EFL English as a Foreign Language What's the difference between EFL and ESL? ESL English as a Second Language What's the difference between EFL and ESL? Ex.) To swim is to have fun. IPA International Phonetic Alphabet Learn more here. pp or pa. pple. past participle gone, done, swum, drunk, etc. phonet. phonetic, phonetically See my "Phon" page. phonol. phonology, phonologically See my "Phon" page. prep. preposition to, from, on, under, below, above, etc. pron. pronoun he, she, him, her, they, them, etc. refl. reflexive himself, herself, etc. [U] Uncountable Seen in EFL / ESL dictionaries / lexicons. v.i. verb intransitive no object allowed for this verb. v.t. verb transitive object required for this verb. The CIA Factbook is cool! B-ball Basketball IOU I owe you. BM Bowel Movement YRU here Why are you here? DOB Date of Birth DKDC Don't know; don't care. DLTBBB Don't let the bed bugs bite. ICC International Cricket Council IDK I don't know. ID Identification IKR I know, right? j/k just kidding ILY I love you. K.I.S.S. Keep It Simple, Stupid. Keep It Simple, Silly! K? Okay? MLB Major League Baseball LMK Let me know. NBL National Basketball League MYOB Mind your own business. NHL National Hockey League NVM Never mind. R&R Rest and Relaxation RUOK Are You O.K.? TGIF Thank God It's Friday TL;DR Too long; Didn't read. Korean English WTH What the h***? WWF World Wrestling Federation WTF What the f***? O = Hug YOLO You only live once. amps amperes Amps is measure of electrical current (induction). E Electrical Force (voltage) E = the force required to send 1 ampere (I) through 1 ohm (Ω). It is measured in volts. f frequency Frequency is measured in Hertz (Hz). F Force Force is measured by Newtons (N). I Induction (electrical current) Induction is measured by amperes (amp). "lambda" wavelength Wavelength is a measured by meters. PSI Pounds per Square Inch Only used in the US. php "Personal Home Page" Tools It is a hypertext preprocessor using perl script, developed by Rasmus Lerdorf.